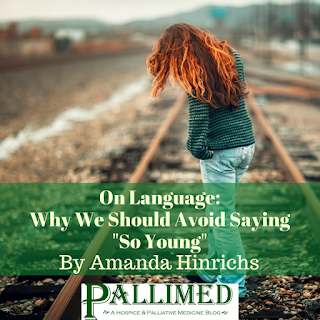 On Language: Why We Should Avoid Saying "So Young"
There is a brief phrase I hear uttered in the halls of the clinic or the hospital, a phrase I have said myself, and it’s a phrase that concerns me. This phrase, “so young,” is uttered by new and experienced clinicians, often when talking about patients who are seen as being too young for the illness(es) they have. This phrase conveys objectivity and societal statistics, but is also laden with personal judgement, empathy, and sadness. As I enter my career in adult palliative medicine, I have been thinking more and more about the importance of language and the way we, the medical community, convey complicated medical information to patients, families, and other medical professionals. This is especially salient as our patients are living longer, and often more medically complex lives. In early medical education, we are taught to briefly present a patient to our colleagues using age (along with gender and race/ethnicity) as the first piece of data. Within a few seconds of learning about a patient, we begin to create a mental image of them in our mind, without ever seeing the patient or hearing about their medical history. We often think very differently about patients when they are 90 years old vs 30 years old, regardless of the illness they may have. People who are younger have, on average, a better chance of recovery from illness, surgery, or injury than someone who is elderly; but I am not talking about a healthy 35-year-old teacher who develops a severe pneumonia and ends up dying in spite of aggressive and appropriate medical care in the ICU. The patients I am talking about who get labeled as “so young”may be far away from retirement age, but have lived with chronic, debilitating illness that many 80 or 90 year olds will never experience. We often use life expectancy data as a general marker of how good our healthcare is. Overall life expectancy for those born in the US in 2015 is 78.8 years, and many of us use this number, consciously or unconsciously, when determining “old vs young,” even though this number does not factor in quality of life or morbidity. When we label seriously or chronically ill patients as “so young,” either in our minds or to our colleagues, we may not allow for an honest and open conversation about medical choice or prognosis until these patients end up in the ICU sedated on a ventilator, with little chance of leaving the hospital. By labeling patients as “so young,” we may not allow patients to understand their age and their medical problems are not dependent variables. By labeling patients as “so young” we may limit our recognition that the lives of these patients have often been paternalistically directed by tests, labs, procedures, and operations without the chance for open shared-decision making. By labeling patients as “so young,” we may not accept death as an outcome. As healthcare providers, we are continually trying to see our patients with an open mind, unbound by stereotypes, bias, or personal beliefs, and I think age is one more variable we need to be aware of as we strive to see our patients as honestly as possible. If you hear the phrase “so young” or say this phrase internally, explore what this means, and how this may affect the care of your patient. By doing this, we can respect the medical conditions our younger patients have lived bravely and strongly with for months, years, or their entire lives, and remember that age does not discriminate when it comes to illness.